Represented by a cross surrounded by two half-circles, Uranus is connected to what's the most personal and creative about us. It's also about our non conformism, our connection to freedom with a slight tendency to rebellion. It is connected to new technologies, time and space, our ability to be creative and our personal evolution. Keywords: Individualism, intuition, originality, creativity, modern, freedom, revolutionary, rhythm, unstability. Flaws: Individualism, non conformism, versatility. 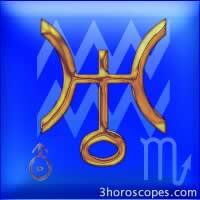 Correspondences: with the sign of Aquarius and Scorpio. The nervous system. Electric blue, Uranium.